Ranbir Raj Kapoor (14 December 1924 – 2 June 1988), also known as "the greatest showman of Indian cinema", was a noted Indian film actor, producer and director of Hindi cinema. Born at Kapoor Haveli in Peshawar to actor Prithviraj Kapoor–he was a prominent member of the Kapoor family–that produced several celebrated Bollywood superstars. Kapoor is regarded as one of the greatest and most influential filmmaker and actor in the history of Indian cinema. He was the winner of several accolades including 3 National Film Awards and 11 Filmfare Awards in India. 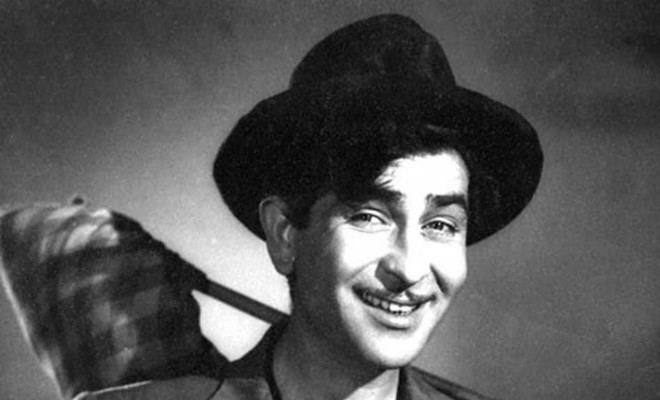 The Filmfare Lifetime Achievement Award is named after Raj Kapoor. He was a two-time nominee for the Palme d'Or grand prize at the Cannes Film Festival for his films Awaara (1951) and Boot Polish (1954). His performance in Awaara was ranked as one of the top ten greatest performances of all time by Time magazine. His films attracted worldwide audiences, particularly in Asia and Europe. He was called "the Clark Gable of the Indian film industry". The Government of India honoured him with the Padma Bhushan in 1971 for his contributions to the arts. India's highest award in cinema the Dadasaheb Phalke Award was bestowed on him in 1987 by the Government of India. Kapoor was born into a Punjabi Hindu family in 1924 at Kapoor Haveli, a house then owned by his father, in Peshawar, North Western Frontier Province, British India (in modern-day Pakistan), to Prithviraj Kapoor and Ramsarni Devi Kapoor. He was the eldest of six children in the family. He was the grandson of Dewan Basheshwarnath Kapoor and great-grandson of Dewan Keshavmal Kapoor, part of the famous Kapoor family. His brothers are actors Shashi Kapoor and the late Shammi Kapoor. He also had a sister named Urmila Sial. Two other siblings died in infancy. They later on moved from Peshawar into present-day India for residence and for education. His maternal cousin, Juggal Kishore Mehra, was a singer, whose daughter, Salma Agha, later became a Bollywood actress. As Prithviraj moved from city to city early in his career during the 1930s, the family had to move too. The constant move meant Raj Kapoor attended several different schools in cities like Dehradun, Calcutta (St Xavier's Collegiate School) and Mumbai. At the age of ten, he appeared in films for the first time, in 1945's Inquilab. After acting in several films over the next 12 years, Raj Kapoor's big break came with the lead role in Neel Kamal (1947) opposite Madhubala in her first role as a leading lady. In 1948, at the age of twenty-four, he established his own studio, R. K. Films, and became the youngest film director of his time making his directorial debut with Aag starring himself, Nargis, Kamini Kaushal and Premnath. In 1949 he co-starred alongside Dilip Kumar and Nargis in Mehboob Khan's hit film Andaz which was his first major success as an actor. He had his first success as producer, director and star of Barsaat released later that year. He went on to produce and star in several hit films made under his R.K. Banner including Awaara (1951), Shree 420 (1955), Jagte Raho (1956) and Jis Desh Men Ganga Behti Hai (1960), the last was directed by Radhu Karmakar, his longtime cinematographer, and which won Filmfare Award for Best Film. These films established his screen image modeled on Charlie Chaplin's most famous screen persona of The Tramp. Outside of his home productions, his other notable films as a leading actor included Anhonee (1952), Aah (1953), Chori Chori (1956), Anari (1959), Chhalia (1960) and Dil Hi To Hai (1963). He also produced the hit social films Boot Polish (1954). and Ab Dilli Door Nahin (1957). In 1964, he produced, directed and starred in the romantic musical Sangam alongside Rajendra Kumar and Vyjayantimala which was his first film in colour. This was his last major success as a leading actor as his later films like Around the World (1966) and Sapnon Ka Saudagar (1968) with younger starlets Rajshree and Hema Malini were box office flops. In 1965 he was a member of the jury at the 4th Moscow International Film Festival. In 1970 he produced, directed and starred in his ambitious film Mera Naam Joker which took more than six years to complete. His son Rishi Kapoor made his debut in this film playing the younger version of his character. When released in 1970, it was a box office disaster and put Kapoor and his family into a financial crisis. In later years it was acknowledged as a cult classic. In 1971, he launched his eldest son Randhir Kapoor in the family drama Kal Aaj Aur Kal starring himself, his son Randhir, his father Prithviraj Kapoor as well as Randhir's to-be wife Babita. He launched his second son Rishi Kapoor's career in 1973 when he produced and directed Bobby which was a huge box office success and introduced actress Dimple Kapadia, later a very popular actress; it was the first of a new generation of teen romances. Dimple wore bikinis which was quite unique for Indian films then. In 1975 he acted alongside his son Randhir again in Dharam Karam, which Randhir also directed. In the latter half of the 1970s and early 1980s he produced and directed films that focused on the female protagonists: Satyam Shivam Sundaram (1978) with Zeenat Aman, Prem Rog (1982) with Padmini Kolhapure and Ram Teri Ganga Maili (1985) which introduced Mandakini. He acted in fewer films by the late 1970s and early 1980s but played a notable supporting role alongside Rajesh Khanna in Naukri (1978) and as the titular character alongside Sanjay Khan in Abdullah (1980). He played a detective in two comedy films: Do Jasoos (1975) and Gopichand Jasoos (1982), both directed by Naresh Kumar (brother of Rajendra Kumar). In 1979 he was a member of the jury at the 11th Moscow International Film Festival. Raj Kapoor's last major film appearance was in Vakil Babu (1982) where he appeared with his younger brother Shashi. A film he had shot and completed in 1982 titled Chor Mandali in which he appeared opposite fellow veteran actor Ashok Kumar remained unreleased due to a legal dispute. His last acting role was a cameo appearance in a 1984 released British made-for-television film titled Kim. He was set to direct Henna starring his son Rishi and Pakistani actress Zeba Bakhtiar before his death in 1988. His son Randhir directed the film and it released in 1991. 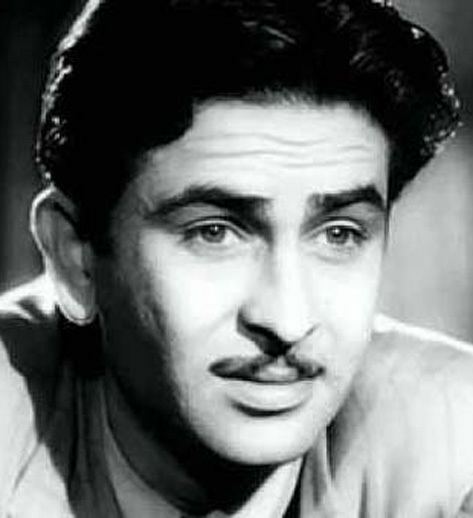 Raj Kapoor suffered from asthma in his later years; he died of complications related to asthma in 1988 at the age of 63. He collapsed at the event where he was to receive the Dadasaheb Phalke Award, and was taken to the All India Institute of Medical Sciences (AIIMS) for treatment. He was hospitalised for about a month before he succumbed to complications arising from his asthma. At the time of his death, he was working on the movie Henna (an Indo-Pakistan based love story). The film was later completed by his sons Randhir and Rishi Kapoor and was released in 1991. Raj Kapoor is appreciated both by film critics and movie fans. Film historians and movie buffs speak of him as the "Charlie Chaplin of Indian cinema," since he often portrayed a tramp-like figure, who, despite adversity, was still cheerful and honest. His fame spread worldwide. He was adored by audiences in large parts of South/Central/Southeast Asia, the former Soviet Union/Bloc, China, the Middle East, and Africa; his movies were global commercial successes. Raj Kapoor had the knack of getting the best out of any one, since he had mastered all departments of film making and even marketing them. His films reflected the era in which they were made. The song is still extremely popular and has been featured in a number of movies since Shree 420 was released. Indian author Mahasweta Devi stopped the show with her inaugural speech at the 2006 Frankfurt Book Fair when she used these lyrics to express her own heartfelt patriotism and debt to her country. Raj Kapoor was a canny judge of filmi music and lyrics. Many of the songs he commissioned are evergreen hits. He introduced the music directors Shankar-Jaikishan and the lyricists Hasrat Jaipuri and Shailendra. He is also remembered for his strong sense of visual style. He used striking visual compositions, elaborate sets, and dramatic lighting to complete the mood set by the music. He introduced the actresses Nimmi, Dimple Kapadia, and Mandakini, as well as launching and reviving the careers of his sons Rishi, Randhir and Rajiv. Famous for making his actresses reveal the body, not very common then in Indian cinema, it was said his 'show-womanship' matched his showmanship. The 1967 "Song about yogis" (Russian: Песенка про йогов) by Vladimir Vysotsky mentions Raj Kapoor as one of the three best-known symbols of Indian culture in the Soviet Union, along with Shiva and yoga. A postage stamp, bearing his face, was released by India Post to honour him on 14 December 2001. To honour him, a brass statue of his was unveiled at Walk of the Stars at Bandra Bandstand in Mumbai in March 2012. In 2014, Google commemorated his 90th birthday. In May 1946, Raj Kapoor married Krishna Malhotra (b. 30th December 1930), who was his first cousin once removed. 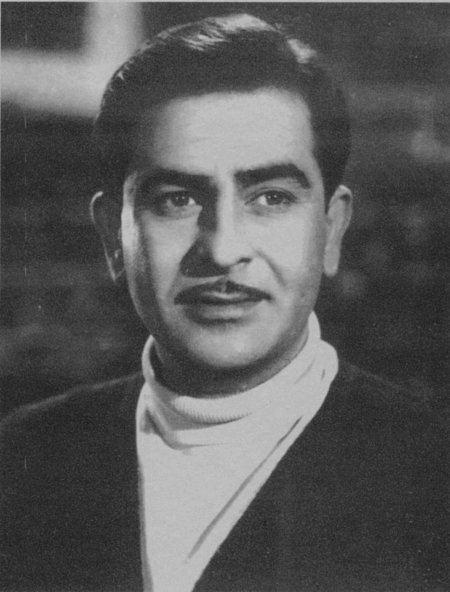 Krishna's father was Prithviraj Kapoor's maternal uncle. It was a match arranged by their families, according to Hindu traditions. Krishna's brothers, Rajendra Nath, Prem Nath and Narendra Nath, later became actors, and her sister Uma is married to the actor Prem Chopra. The news of Raj Kapoor's marriage was reported in the cine-magazine Filmindia June 1946 issue as, "Raj Kapoor, the talented and versatile son of Prithviraj Kapoor ended his career of wild oats by marrying Miss Krishna Malhotra in the second week of May at Rewa". Raj and Krishna Kapoor were blessed with five children: three sons, actors Randhir, Rishi and Rajiv, and two daughters, Ritu Nanda and Rima Jain. Randhir is married to former small-time starlet Babita and is the father of actresses Karishma Kapoor and Kareena Kapoor. Rishi is married to former starlet Neetu Singh and is the father of two children, a daughter Riddhima, and a son, the actor Ranbir Kapoor. Raj Kapoor's elder daughter, Ritu Nanda, is the wife of industrialist Rajan Nanda (scion of the family which promoted and controls the Escorts group), and she is the mother of two children. Her son, Nikhil Nanda, is married to Shweta, daughter of actors Amitabh Bachchan and Jaya Bachchan. Raj Kapoor's younger daughter, Rima Jain, is the wife of investment banker Manoj Jain and mother of aspiring actor Armaan Jain. Kapoor was rumoured to have had a longtime romantic relationship with the renowned actress Nargis during the 1940s and 1950s, despite being a married man, although neither ever publicly admitted to this. The couple starred in several films together, including Awaara and Shree 420. As Raj would not leave his wife and children, Nargis ended their relationship after Chori Chori and married Sunil Dutt with whom she fell in love on the set of Mother India (1957). Kapoor is also said to have had an affair with renowned actress Vyjayantimala during the shooting of Sangam. Vyjayanthimala has denied that she was ever involved with Kapoor. She deemed the whole thing a publicity stunt by Kapoor to promote his film. Kapoor has also been linked with the southern actress Padmini. Both of Kapoor's brothers, all three of Kapoor's sons, two of Kapoor's daughters-in-law and three of Kapoor's grandchildren have been active at various times in the film industry. His granddaughters Karisma and Kareena (daughters of Kapoor's eldest son Randhir), and grandson Ranbir (son of Kapoor's second son Rishi) are the latest Bollywood superstars from the Kapoor family, while another of his grandsons, Nikhil Nanda (Kapoor's daughter Ritu's son), is a noted industrialist. 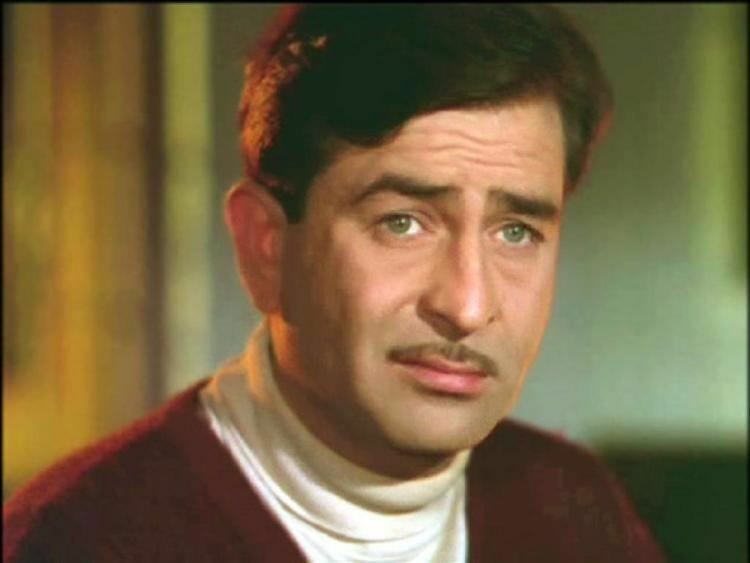 Raj Kapoor: The Great Showman “Jeena Yahan, Marna Yahan, Iske Siwa, Jaana Kahan“, very few people in this world understand the real meaning of these lines and I am glad, I understood them during the early phases of my life, thanks to my parents who made me watch this movie. I am not a Bollywood freak. But, yes there are some things that Bollywood offers that you just cannot ignore. The great showman, Raj Kapoor Sahab, was one of them. Kapoor had received many awards throughout his career, including 3 National Film Awards, 11 Filmfare Awards and 21 nominations. His films Awaara (1951) and Boot Polish (1954) were nominated for the Palme d'Or at the Cannes Film Festival. His acting in the former was rated as one of the "Top-Ten Performances of all time" by Time Magazine. His film Jagte Raho (1956) also won the Crystal Globe award at the Karlovy Vary International Film Festival. The Government of India honoured him with the Padma Bhushan in 1971 and the Dadasaheb Phalke Award in 1987 – the highest award for cinematic excellence in India. In 2001, he was honoured with "Best Director of the Millennium" by Stardust Awards. He was named "Showman of the Millennium" by Star Screen Awards in 2002. In June 2011, Noah Cowan, Artistic Director of TIFF Bell Lightbox, and Sabbas Joseph, Director, Wizcraft along with members of the Kapoor family came together to pay tribute to the life and work of Indian actor, director, mogul and legend Raj Kapoor, as presented in partnership by TIFF (Toronto International Film Festival), the International Indian Film Academy (IIFA), and the Government of Ontario. Indian Mirror Reports suggest Kapoor will be inducted onto the Brampton Walk of Fame in Ontario, Canada. Khwaja Ahmad Abbas was a screenwriter and director for a number of Raj Kapoor's best films. Shankar-Jaikishan were Raj Kapoor's music directors of choice. He worked with them in 20 films in all including 10 of his own films from Barsaat until Kal Aaj Aur Kal. (Jagte Raho with Salil Chowdhury and Ab Dilli Dur Nahin being two exceptions in this period). Only after Jaikishan died, did he turn to a different music director – Laxmikant-Pyarelal for Bobby, Satyam Shivam Sundaram and Prem Rog (later on, his children used Laxmikant-Pyarelal for Prem Granth as well), Rahul Dev Burman for Dharam Karam, and Ravindra Jain for (Ram Teri Ganga Maili and Henna). It is interesting to note that Raj Kapoor acted in a movie with music by Madan Mohan only once (twice) i.e. Dhoon (1953) & Aashiana (1952) which featured duet Hum Pyaar Karenge by Hemant Kumar and Lata Mangeshkar, the only instance of Hemant Kumar giving playback to Raj Kapoor, and did only one movie with O. P. Nayyar (Do Ustad). Raj Kapoor and Nargis worked together in 16 films including 6 of his own productions.